Polls show that an overwelming majority of Kansas citizens favor legalizing medical marijuana. The term "Legalizing" is of specific importance with reguards to marijuana. There is a difference between legalizing marijuana for recreatonial and medical use. There is an even greater difference between Legal and Illegal when we speak about marijuana. Keeping marijuana illegal, helps to perpetuaite black markets and bars any oversight of the product. This willfull lack of regulation and oversight henders the ability protect the public in a way we would with any other product. The Kansas Silver Haired Legislature recently passed a non-binding resolution supporting Kansas Senate bill SB9 that was introduced in 2013 by Senator David Haley. 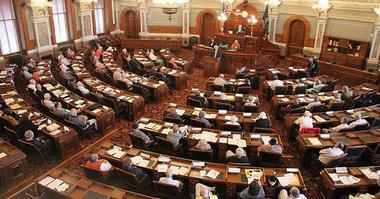 The Kansas Silver Haired legislature represents approximately 450,000 Kansas citizens over the age of 60. These wise elders of our state have come to understand that the propaganda of the past has been just that and they are demanding change just like the rest of us. A great deal of the success in ending the misinformation and propaganda is due to people like retired undercover narcotics officer Jack Cole and the great work done by LEAP. Jack Cole addressed the KSHL on October 2, 2013, speaking out about the failed war on drugs and the damage that this assumed solution has actually done to our society. any other social welfare activities within the meaning of Section 501(c)(4) of the Internal Revenue Code. Although Marijuana (Cannabis) is on Schedule 1 of the Controlled Substances Act, a federal law, alleging that it has no acceptable medical use, there are many states and countries around the world, in which it is accepted for medical use. There are even studies sanctioned by the US government which show demonstrable benefits to the use of marijuana, but the most extensive research has been done overseas due to the restrictions in the US. However, it is clear that marijuana has never caused a death, while legal alcohol kills thousands every year. In spite of the benefits of marijuana, the Drug War begun by President Nixon has proven to be a means to prosecute and imprison large numbers of mostly minority people. The initial criminalization of marijuana was based on its use by people who were stereotyped as bad characters, blacks and Mexicans, and that became a way to keep those communities under control. In addition, the billions spent on the Drug War have only led to violence by cartels, street thugs and the police; as well as imprisonment and community disruption for hundreds of thousands otherwise law-abiding people. It has not led to reduction in the use of marijuana. Rather it has operated to enrich the criminal cartels, the prison industry, prescription drug makers, and police organizations which receive money for arrests whether or not those arrests result in convictions. Jury nullification (a finding of “not guilty” in the face of unfair prosecutions) has become the only way for the public to express its opposition to these unjust laws. We feel that drug abuse is a public health issue, rather than a criminal one. If abusers steal or otherwise break the law, they should be jailed for those crimes, and if needed, provided with treatment for their addiction. For patients who find more benefit from marijuana than from prescribed pain killers, and for others who just use marijuana to relax, we are working to change the law so that they may not face criminal penalties for their use.